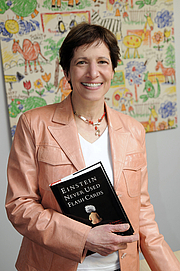 Includes the names: Kathy Hirsh-Pasek Ph.D.
Dr. Hirsh-Pasek’s talk is based on her book Einstein Never Used Flashcards: How Our Children Really Learn—and Why They Need to Play More and Memorize Less In it, she offers a compelling indictment of the growing trend toward accelerated learning, with a message that letting tots learn through play is not only okay—it’s better than drilling academics. Included are 40 age-appropriate games for creative play. Kathy Hirsh-Pasek is currently considered a "single author." If one or more works are by a distinct, homonymous authors, go ahead and split the author. Kathy Hirsh-Pasek is composed of 2 names. You can examine and separate out names.